Business models involving freelancers or independent contractors are gaining huge traction and popularity these days. Uber, Lyft, AirBnB and many other new ventures are enormously successful and often provide equal or even better service at lower costs than incumbent providers. Can established companies leverage this innovative business model and reap similar benefits from an increased use of contractors, specifically in temporary PLM and NPD projects? If you’ve ever used one of these new services, you know that the contractors that provide them – drivers, hosts, etc – have to prove themselves in every drive, during every stay and for every “gig”. They have their own skin in the game, and their life and future earnings depend on providing the best service possible. If they don’t, the feedback is usually quick, visible publicly, and the ramifications are severe. Business vanishes because nobody wants to drive in a filthy car with someone who gets lost all the time and arrives late, or stay in a dirty room with an uncomfortable bed. And besides often better service, customers also benefit from lower prices because companies that rely on contractors have lower costs as they pay only for work actually performed and not for all the ancillary expenses, such as paid-time-off, health care coverage, unemployment insurance, the downtime between projects, etc. The same benefits can be achieved by established companies when using contractors in PLM and NPD projects. And the numbers show that this new employment model benefits not only companies financially, but also contractors and, as indicated above, customers as well. Employee compensation numbers published by the United States Department of Labor, Bureau of Labor Statistics (bls.gov) on September 9th, 2015 show that 30.5% of the total employee compensation in the private industry is related to benefits, including paid leave, insurance and other legally required benefits. These are expenses that companies are legally required to pay to employees, but not to contractors. In addition, while employees take home only 69.5% of their total compensation, they do pay taxes on the full 100% of their income. 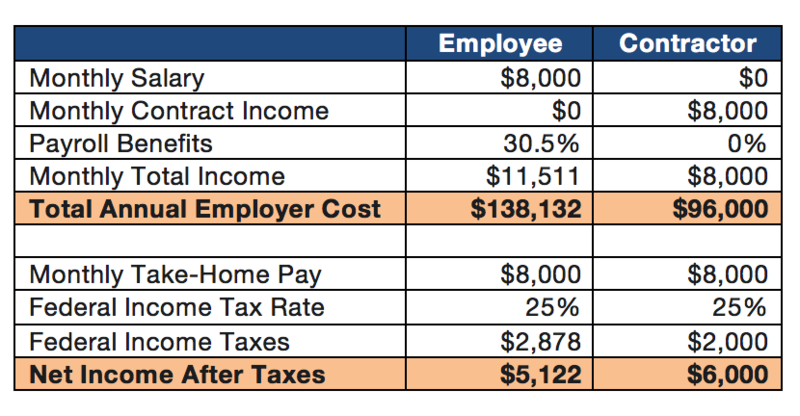 The comparison below shows that with equal monthly pay for an employee and a contractor, in this example $8,000, the annual cost for the employer is almost $42,000 higher for an employee than for a contractor. At the same time the contractor has an almost $900 higher monthly net income than the employee. And then there are many non-financial benefits for companies. First, contractors are by definition temporary resources. So when PLM or NPD projects end, which by definition are also temporary, the contractor will move on and find another project. Unlike with employees, the company is under no obligation to look for other suitable work, but can certainly extend the contract duration if desired. Further, contractors typically are specialists with years of experience and expertise in the area in which they are working. They are used to working on new projects and taking on new responsibilities, and as a result, are typically quickly up to speed on a new task and need very little training and transition time. And finally, as indicated above, contractors have their own skin in the game. Their future business depends on excelling in every project, and it is my experience that contractors often work many extra hours without billing the customer just to make sure the customer is happy. To learn more about the benefits of using temporary contract resources in your PLM and NPD projects, go to http://plmadvisors.com/plmtemps/ or call us at 888.800.4PLM (888.800.4756).